Hello! 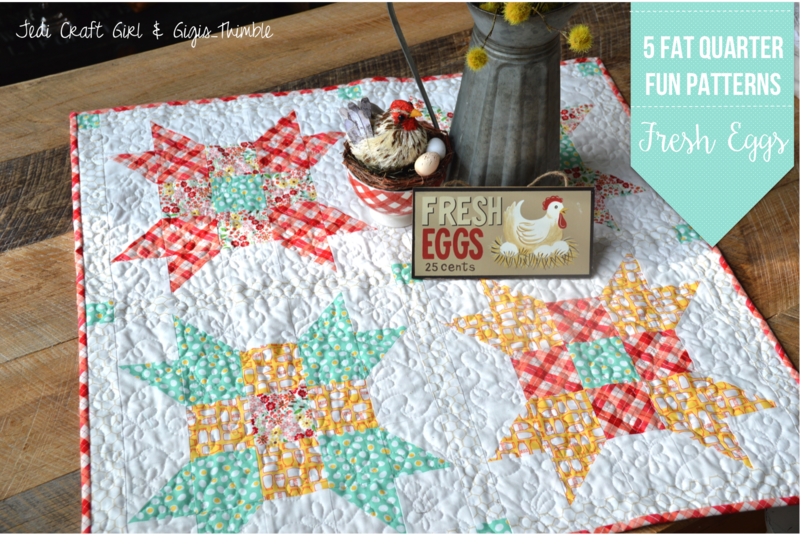 Today I have a free quilt pattern for ya! This pattern was a done in collaboration with my cute friend, Amanda, aka Jedi Craft Girl. We first met in Salt Lake City at Spring Quilt Market 2016. I thought she was just the sweetest, cutest gal ever and wished we lived closer so we could hang out more! When I noticed from Instagram that we were both in St. George, Utah for the Thanksgiving holiday we decided to meet up! She had my little family over for pie (so sweet) and then we made time for a little fabric retail therapy the next day. I can't take a whole lot of credit for this 5 Fat Quarter Fun project. Amanda wanted to do a project using just 5 fat quarters so we picked out some fabrics together while we were in St. George. Then she came up with the design and wrote the pattern. I looked it over but was mostly just there for the ride! I love these big 15" blocks and the happy colors! And I just so happened to have had this vintage fabric in my stash that was my grandmothers! It's a little hard to tell but the fat quarters we used have eggs, chicken wire and milk jugs on them so I just HAD to use this fabric for the back! 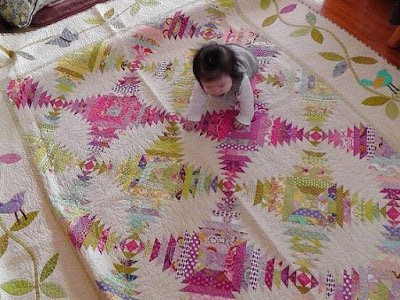 I think this size quilt would make a great little baby quilt or wall hanging. And it whips up really quick! If you'd like the FREE pattern, head on over to Amanda's blog (click HERE). We're hoping to do some more of these little 5 Fat Quarter Fun projects in the near future. Maybe next time it'll be my turn to design! Do you know the blog, Messy Jesse? Well I have been a big fan of the author, Jessie Finchman, for a long time. I've been following her blog forever and her Instagram account for ages. One day I was just scrolling through Instagram, minding my own business, when I saw a picture of the most amazing quilt. It stopped me dead in my tracks and I sat there studying that quilt (called Penny Tiles) for a while trying to figure out how she did that!?! Then, a short while later I get a message from Jessie asking if I'd be willing to test the pattern out for her. So of course, I was like, yeah (duh :). And here we are. Almost a year later. I picked some of my favorite colors/fabrics and just had fun with it. 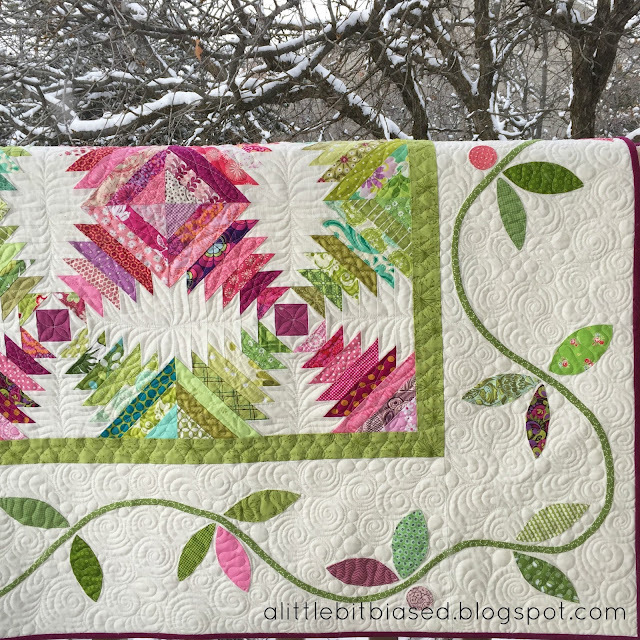 Jessie might have thought that I would only make a block or two but I loved the pattern so much I knew I wanted to make the whole thing! of the white stars in the corners of the blocks. so I decided to hang onto those to use for another "side project" later. 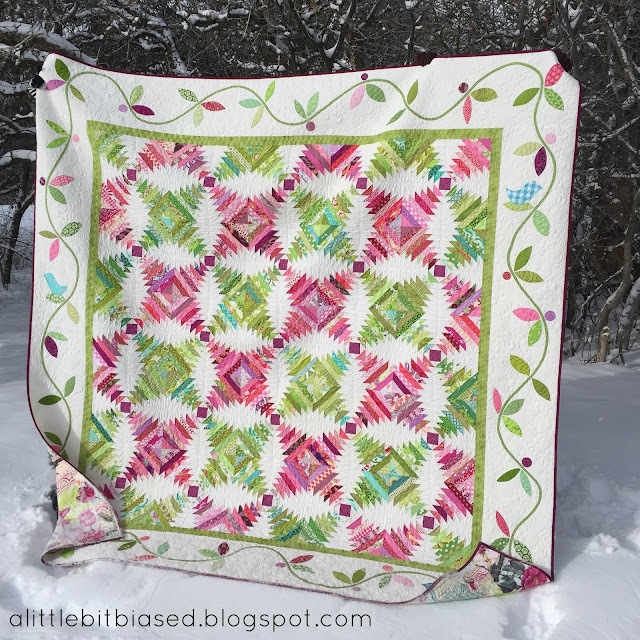 Thus, my little Pinwheel quilt. It was perfect because I had enough trimmings from each block to make 4 matching pinwheels of the main bright fabric and 2 matching pinwheels of the second bright fabric! I just sewed a bright and a white triangle together to make a half-square triangle, squared them all up to 2.25" and then made pinwheels. I alternated the pinwheels with white squares of the same size and made this really simple quilt! The blocks finished at 3.5" and the whole quilt finished at 45.5" x 60". These were both quilted by Cathy Barney in Alpine, Utah. 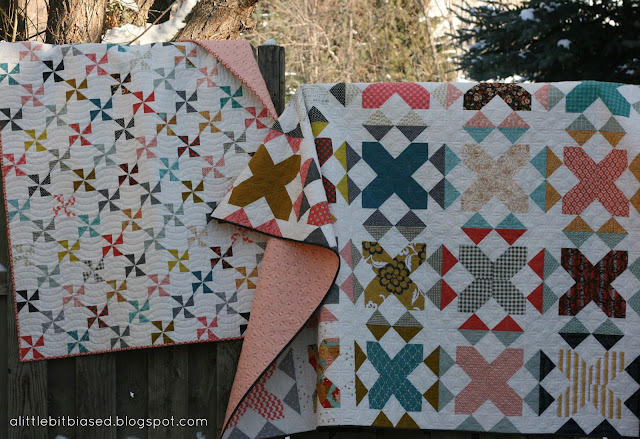 I used two of my go-to patterns, the interlocking orange peel on the Penny Tiles quilt and wavy lines on the Pinwheel quilt. Cathy always does a fantastic job! These will be going to a good friend for Christmas. I hope she likes them! Are you busy making handmade gifts for Christmas? They're the best kind!